This program is discontinued. For updates, please join our mailing list or check out our Get Writing Again creative writing email course. If you haven’t been writing lately and have feelings of guilt and shame around the fact that you are not writing, it’s time to forgive yourself. Let go of the past, and start over today. That’s one of the beautiful things about being human: We get to start over. Just like the sun appears to rise every day, so do our chances to begin anew. Tell yourself you are starting over today. 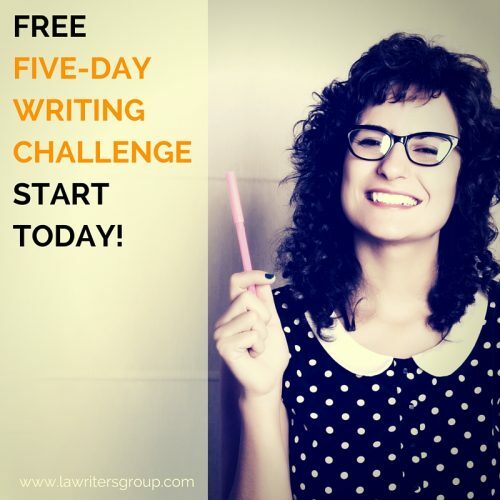 To help you get started, I’ve created the Five-Day Writing Challenge, where you will get a writing prompt emailed to you every day and all you have to do it open your email, read the prompt, and write. The Five-Day Writing Challenge is a free mini version of my 15-Day Writing Challenge, an email-based coaching program designed to get you to fall back in love with writing and reestablish a daily writing habit. All you have to do is sign up for our newsletter, and you’ll get your first prompt emailed to you immediately. Nothing more. If at the end of your five-day writing challenge you’d like to jump into the 15-Day Writing Challenge, you’ll get a special discount code emailed to you on Day 6. That’s it! Use that prompt as a jumping off point to write today.